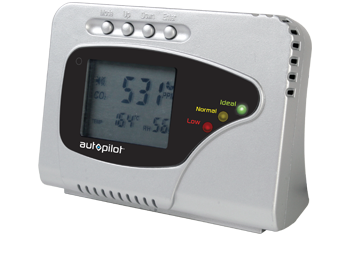 Developed to detect the presence of CO2 in ambient air, the Autopilot desktop CO2 monitor is smart, compact and easy to use. In addition to measuring the CO2 concentration, APCEM also measures the ambient temperature and the relative humidity. High quality LCD display. Independent CO2, RH and temperature readings. 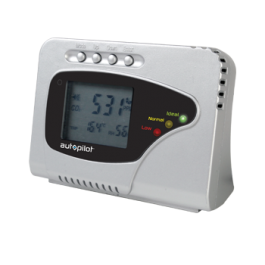 Calculates and displays ventilation rates. Power Supply: 100- 240 VAC 50 / 60 Hz, 6 VDC from external AC/DC adapter which is included.